Well, where do I begin? I’m a sucker for post-apocalyptic/zombie stories. I especially enjoy reading about survivors who struggle not just with the ongoing threat, but with themselves as well. To me, and some may disagree, The Walking Dead was truly groundbreaking in developing this kind of zombie fiction. Broken Cortex #1 presents itself as a less engaging, less cohesive take on the genre. 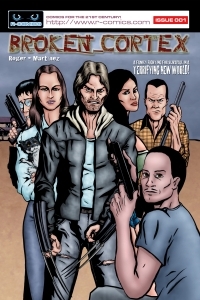 I was initially drawn into the comic by two factors: a new zombie story and a family drama. You can imagine the disappointment when I discovered that the writing was very stale — especially the dialogue — which made it very hard to care for any of the characters. While I will hand it to Roger for coming up with a new form of zombie (sorry, no spoilers), it was not nearly enough to save this comic in my eyes. Martinez’ illustrations were also unflattering. There were four women in this issue and I could only tell one of them apart from the rest because she had short hair. While some of the characters were drawn out with more detail and surely more recognizable than others, the backgrounds seem lazily thrown together, giving the impression that the comic in general was rushed. Broken Cortex #1 is a prime example of jumping on the bandwagon. Zombies are so popular these days that it must seem like a sure thing when developing a new story; unfortunately for this particular comic, survival is questionable.